Did you know that the iPad Mini is the most popular iPad? Yep, it outsells the iPad 4 by a margin of two to one. Today, it got a big upgrade. At a special event at the Yerba Buena Center for the Arts in San Francisco, Apple unveiled the second generation of its 7.9-inch little wonder: the new “iPad Mini with Retina display,” which we will hereafter refer to as the iPad Mini 2. The revamped tablet looks roughly identical to last year’s model, but comes with some huge upgrades that turn it into less of a ‘midget cousin’ budget model and more of a ‘cool little brother’ to the full-size iPad (which is also getting its first revamp in years). The new Mini has a Retina screen with double the pixels (2048 x 1536) of its predecessor and comes loaded with Apple’s new 64-bit A7 processor. The Mini will join the new revamped iPad, now dubbed the iPad Air, which is much lighter and thinner than its predecessor. Since the Mini is replacing a tablet that was already incredibly thin and light, it hasn’t noticeably changed its form factor or weight. Unlike the first iPad Mini, Apple is not skimping on power this time around. The new model appears to be a completely functional iPad replacement. However, though it included a Touch ID fingerprint sensor on the iPhone 5S, the new Mini has a standard Home button. As you’d expect, the new tablet will come preloaded with iOS 7 and is compatible with all previous iPad software. Those who buy it (or a new iPhone 5S or iPad 5) can also get new versions of iWork, Apple’s Office-like spreadsheet and word document suite, for free. 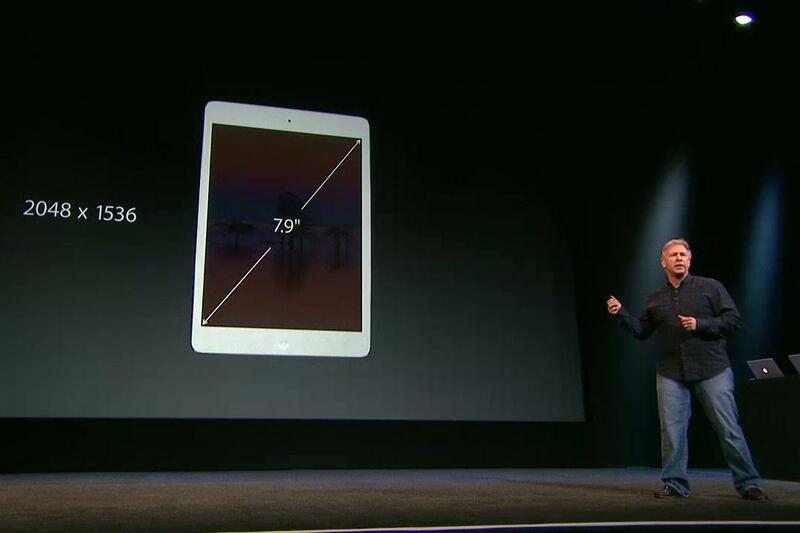 Apple claims that the new A7 processor will enable a new, more powerful generation of tablet software. The new Mini has a processor that’s 4x faster and a graphic processor that’s 8x faster than its predecessor. Our own Adam Rosenberg speculated how an A7-equipped iPad Mini could revolutionize games on iOS. Upgraded Wi-Fi, LTE coverage, and a better FaceTime camera are also included. The iPad Air will both go on sale November 1, while the iPad Mini 2 lands sometime later in November. The new iPad Mini will cost $400, but Apple will continue to sell last year’s Mini model for $300. Both new iPads will come in white/silver or black/space gray. New SmartCovers for the Mini and Mini 2 will cost about $40, and Apple will sell a new cover that also includes a case for $70. Both will come in a variety of colors, including a bold red.